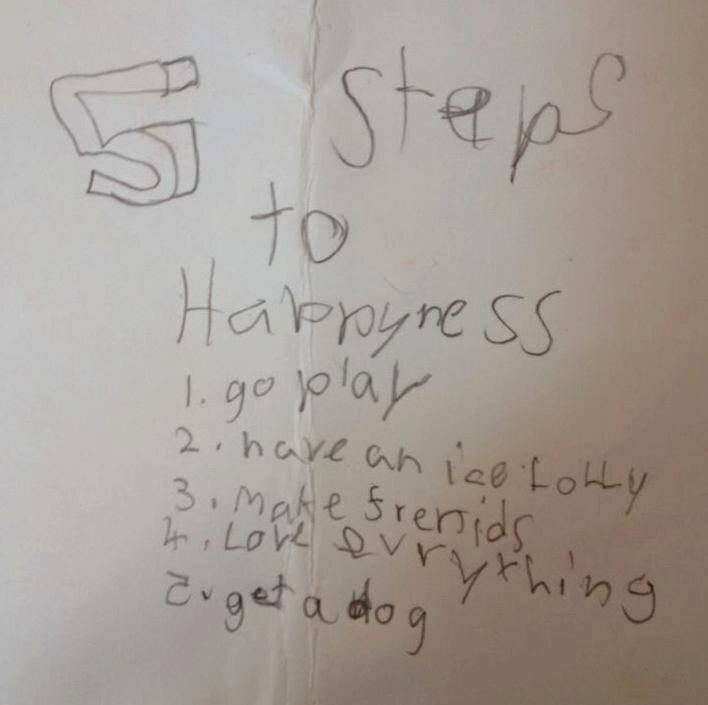 I think that this picture of a child writing 5 steps to Happyness is fantastic. There is such truth in the simple things in the list. In this high tech world we live in there is so much to process in just one day. Social media, work, planning, decisions to be made about every little thing. No wonder we are overloaded with negative thoughts, worry, stress, ailments and have very little time to remember what being happy was or even things to do that will lift our mood. The sun was shining this morning when I woke at 6am, from my window I saw some birds alight on the top of a nearby tree, flap their wings at each other and settle down for a few bars of the dawn chorus. Clouds studded by changing shape into interesting patterns, blossom opened overnight. (Yes, I know I’m waxing lyrical but it was early before my mind started the daily grind). I wondered what the day would bring and realised that my Happyness level felt like an amazing 8, the highest so far. Just being actively aware of nature for a few moments had really perked me up ( I also noticed that a neighbouring house had put an aerial on the top of the roof and spoilt my view). Throughout my busy day, for the first time I asked colleagues what their Happyness number was, strange looks were shot my way but they did smile when they replied. I responded with “why not make it a higher number by the end of the day?” When I met them again their numbers were higher and they had spread the word. Just heard the chimes of the ice cream man at the end of the road, one Mr Whippy here I come. It’s so simple but also so profound. We all really need to play more, have fun, not take eveything so seriously, love life, spend time with those who we enjoy spending time with, cuddle some furry friends, and treat ourselves with yummy treats. “Go Play. Make Friends. Love Everything.” It sounds like the perfect formula.